Posted 2:53 pm by Kayla Sheets & filed under Pregnancy Planning. How does a person or couple decide to have a baby? In part 2, we asked a child-free man, a mother of two teens and a millennial woman about their experiences with this life-changing decision. What was their story? How did their partners handle it? What advice does Merle have for them? Do they have special advice to folks who are in the midst of the big debate? Grab a copy of Merle’s outstanding book. Order extra copies for your closest friends and family. 2. Or simply order your copy of The Baby Decision by clicking here. Steve Slavsky is a business consultant teaching management and presentation skills. He has been happily married for 28 years and is child-free. Steve also dances and teaches Argentine tango. He lives in Medford, MA. Paula Sakey is a development professional who lives in Arlington, MA. She and her husband have been married for 21 years and have two teenaged children and a fur baby named Winnie. Sam Bruce, Producer. Since graduating from Reed College, Sam became a production intern with CCTV, and is creating short documentaries, and producing several shows. She is currently child-free. 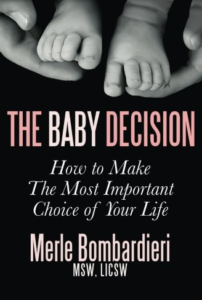 Merle (Malkoff) Bombardieri, is a clinical social worker/psychotherapist and author of the Baby Decision: How to Make the Most Important Choice of Your Life. Merle is specialized in parenthood decision-making, infertility, adoption, and making the most of a childfree life. This revised second edition of The Baby Decision is based on 35 more years of work guiding decision-makers in educational workshops, psychotherapy and long-distance coaching for people around the world. Merle’s writing has appeared in Our Bodies Ourselves, Brides, Glamour, Self, the Boston Globe Magazine, Boston Magazine medical journals and psychology blogs. 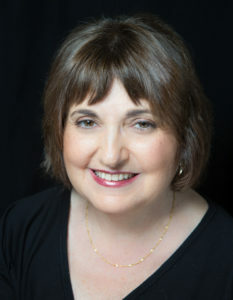 She has lectured at Harvard Medical School, M.I.T., Wellesley College, and the Cambridge Center for Adult Education. She has appeared on national radio and television news shows, talk shows and documentaries, including the Leeza Show. Merle’s work has been quoted in Time, Newsweek, the New York Times, the Boston Globe and the Huffington Post. Merle is married and the mother of two grown daughters and the grandmother of a two-year-old boy. She enjoys creative writing, yoga, hiking, and travel. She is working on a novel, Don’t Ask, about two sisters and a surrogate pregnancy. Kayla M. Sheets is a board-certified, licensed genetic counselor and founder of Vibrant Gene Consulting, a concierge practice located in Cambridge Massachusetts. Kayla is dedicated to taking genetic insights and translating them into greater health and wellbeing for her clients. She also provides expert advice about parental DNA testing to confirm relationships. Thinking about expanding your family? Join us for to learn about a powerful test called “carrier screening” for yourself and your partner. Which lab does Kayla recommend most to her clients? Why is this single blood test considered one of the most important, valuable tests to do pre-pregnancy? Tune in to find out! For Private Genetic Counseling, visit our website at www.vibrantgene.com. We are also reachable via email (contact@vibrantgene.com) or phone at (617) 433-7874.